Price increases to $150 on June 15. VIP tickets and tables available. 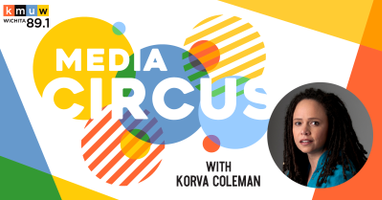 KMUW's Media Circus presented by NetApp returns on Saturday, June 29, with NPR celebrity guest Korva Coleman! Join us at The Cotillion for this unique benefit highlighting the comedy of current events. Appetizers, cotton candy and a buffet dinner will be provided by The Anchor. Festive cocktail attire is encouraged. As KMUW's annual fundraising event, Media Circus helps diverse news coverage and quality journalism continue to thrive in south-central Kansas. General Admission Tickets are $125 through June 14, and increase to $150 June 15-28. Tickets will not be sold the day of the event. VIP Individual Tickets are $200 and include priority seating, top shelf drinks, and access to the meet-and-greet event with NPR's Korva Coleman. VIP Tables are $1,500 and include a table for 10 near the event stage, top shelf drinks, and access to the meet-and-greet event with NPR's Korva Coleman. Wichita icon Bonnie Bing returns as our co-host. Local journalists Cindy Close, Larry Hatteberg and Denise Neil will join us for stage games. Media Circus Ringmaster Korva Coleman is a newscaster for NPR. In this role, she is responsible for writing, producing, and delivering national newscasts airing during NPR's newsmagazines All Things Considered, Morning Edition, and Weekend Edition. Occasionally she serves as a substitute host for Weekend All Things Considered, and Weekend Edition.